The actual Southern California locations where Will Smith's "BRIGHT" was filmed. 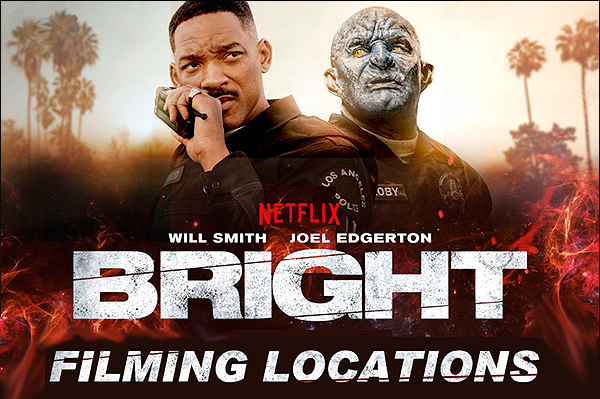 "BRIGHT" is set in an alternate-universe earth, in which humans live side-by-side with fantasy creatures such as fairies, elves, orcs, wizards, and even centaurs. And in the gritty, urban environment where our two world-weary heroes patrol the streets as police officers, many of these groups have formed into gangs, with their own codes. Outside, in his front yard, he encounters a group of gang-bangers having a party next door. They watch as he brandishes a broom against the pesky fairy, swatting at it like a baseball batter, until he eventually knocks it down, then squashes it. So where is it in real life? This is an actual home in L.A.'s Hyde Park neighborhood, near Leimert Park. The address is 4501 9th Avenue, in Los Angeles. That is a north/south street, a block south of Vernon Avenue. His house is a one-story craftsman-style bungalow, on the west side of the street. across the street, that we see in the movie. 13:00: Will is out on patrol with his partner, an orc named 'Nick Jakoby' (played by Joel Edgerton). Taking a shortcut, the cops' patrol car winds up rolling through "Elf Town", and Will remarks that he hates the neighborhood. It appears to be filled with well-to-do, smartly-dressed, pointy-eared elves who occupy positions of wealth and power in this world. The center divider in this street is encircled by a tube-like railing, which seems to be made out of either gold or polished brass. So where is this area in real life? They are driving south down Grand Avenue, passing the Wells Fargo Center (on their right) and California Plaza (on their left). This is the upper (street-level) part of Grand Ave. There is also a lower, subterranean level of Grand Ave which runs right below the upper level, and which consists mostly of access to parking garages and lower-level stores. They faked that gold center divider. There is, in fact, an open portal in Grand Ave right there, which leads down to that lower level, but that hole does not have a shining gold banister around it, merely the usual gray metal one. 13:32: Their patrol car pulls into what looks like what might be a heavily-fortified prison, but it turns out to be the Police Station in this rough city. So where is this place in real life? This building is actually a Department of Water & Power plant, at 1141 W. 2nd Street (at Boylston Street), in Los Angeles, CA. That is just west of the Harbor Freeway in downtown, and is not to be confused with the more well-known Water & Power building a couple of blocks to the east (at 1st & Hope), next to the Music Center (that one has been featured in a number of movies, including "Inception"). 0:19:57: Will and his Orc partner are out on patrol when they answer a call to an urban intersection, and find there a bearded, shirtless wild-eyed homeless guy (who looks somewhat like a Neanderthal) waving a broadsword and shouting rhetoric. Later, it turns out that this guy is a member of the "Shield of Light", an organization that believes only magic can stop the return of the Dark Lord. And he tell Jakoby that he is part of a prophesy. So where is this intersection in real life? This intersection is located at Westlake Avenue & 7th Street, in Los Angeles. (That's west of downtown, just southeast of MacArthur Park). They are heading east on 7th Street when they roll in. 0:30:00: is when we first see "The Abrams House ", which turns out to be a safehouse for the "Shield of Light" to stash those they're trying to protect, like Tikka. Much of the movie takes place here, including many of the shoot-outs, magical battles, and the fiery conclusion. When our two cops first arrive on a basic call, they discover some very weird goings-on inside the creepy building, including clear signs of dark magic. It turns out that the evil inferni have attacked the safehouse, killing many. And while there, they discover a female elf in hiding, Tikka, a young "bright" bearing a powerful magic wand. This valuable wand becomes the center of a heated conflict. First, their fellow cops plot to kill both of Ward & Jakoby to steal the valuable wand. When they escape that mess (by killing the corrupt cops), they are confronted by a Latino street gang, demanding the wand for themselves, and later by an Orc gang, all the time being pursued by the dark elves of the inferni - all seeking the wand. Eventually, the place gets blown up and burns to the ground, during a magical battle. They go back to the house (to save Tikka, by putting her in the pool there), at 1:31:52. The place burns down at 1:42:13 (after Will uses the explosive power of the wand). This is an actual apartment house, and it is located at 451 Coronado Terrace (west of Echo Park), in Los Angeles. It is right next to the Hollywood Freeway, about half a mile west of Echo Park, and about two miles northwest of downtown Los Angeles. But the movie-makers made the place look much more sinister than it is. While the building does have a heavy iron gate across the main entrance, the producers added a much heavier, protruding iron cage to the front, along with loops of razor wire, and they covered the front of the building in gang graffiti. 0:42:05: In a flashback, we see what happened in an alleyway, as 'Jakoby' tells Will Smith why he let a suspected cop killer escape. It wasn't because the suspect was an orc, like himself. Instead, it's because during the preceding chase, Jakoby lost track of the real suspect, and ended up instead cornering an innocent orc in an alley. When he saw that he had made a mistake, and realized that the cops who would soon arrive would probably kill the young orc anyway, he helped him get away. So, where is this alley in real life? This scene was shot in an alleyway next to 512 S. Broadway, in downtown Los Angeles. That's on the east side of Broadway, between 5th and 6th streets, next to the north side of the building at 512 Broadway. It's a gated alleyway, which runs east/west, and which has been used for filming before (including in this episode of "Agents of S.H.I.E.L.D."). 1:50:20: At the conclusion of the movie, we see a medal ceremony, on the steps of an official-looking building, honoring our two hero cops. 200 N. Spring Street, in downtown Los Angeles. To be more specific, this was shot under the arches on the west side of City Hall, facing Spring Street, with the camera looking east. The photos on this page are screencaps from "BRIGHT"
(which you can watch by clicking here) and are copyright NetFlix.